Shares of cell and broadcast tower operator American Tower (NYSE:AMT) have soared 45% higher during the last year, and more than tripled in five years. There are no guarantees that American Tower's market-crushing joyride will continue, of course. The company depends on wireless network operators investing in their infrastructure, which, in turn, hearkens back to the always-fickle consumer market's thirst for more and better wireless services. Moreover, American Tower faces two massive rivals in Crown Castle International (NYSE:CCI) and SBA Communications (NASDAQ:SBAC), which operate 40,000 and 20,000 American radio towers, respectively. American Tower falls right between them, with more than 21,000 company-owned towers on American soil, and another 7,200 leased tower sites. This is a tight three-horse race, with several smaller competitors trailing far behind. That being said, American Tower investors also have many reasons to believe in continued growth. Here are three of the biggest reasons to get excited about American Tower today. I know, I know... cheering a growth stock like American Tower for its stability is like admiring Peyton Manning for his tackling ability: Defense may win championships, but some players just don't belong in that discussion. But the truth is, American Tower (and its major rivals) backs up its revenue and profit growth with an unusually stable business model. The idea is simple: Buy or lease some strategically located patches of land, build cell or broadcast towers on them, and look for customers to fill these towers with radio equipment. Broadcasters and wireless carriers sign long-term contracts on these tower-space leases -- the average amortization period on American Tower's current customer contracts is 16 years right now. Here's where American Tower starts to separate from its industry peers. The company collects more revenue than Crown Castle or SBA Communications, and tops this advantage with unmatched cash profit margins. The end results: American Tower can look back at nearly $1 billion in trailing free cash flows, which is the highest total in the company's history. 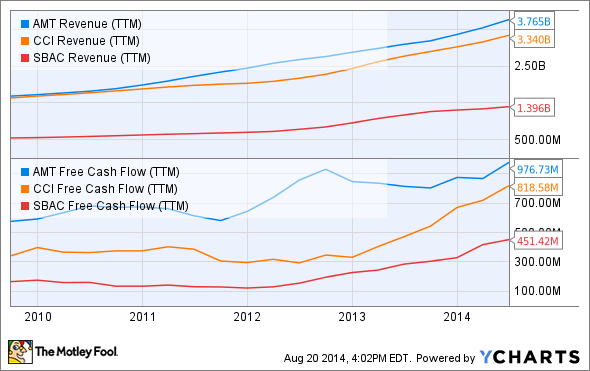 AMT Revenue (TTM) data by YCharts. 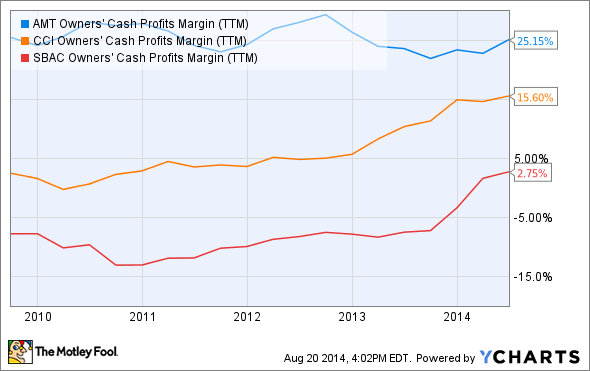 AMT Owners' Cash Profits Margin (TTM) data by YCharts. Free cash flows are the lifeblood of any business, and a popular metric on which investors base their valuation of a firm. American Tower's share prices have soared faster than its cash flows in recent years, leading to a premium valuation of 40 times trailing free cash flows. The company needs to keep growing in order to justify this top-shelf valuation. Credit Suisse analyst Joseph Mastrogiovanni argues that there's plenty of growth to be had in the cell tower space, making American Tower a "buy" because it's the top dog in an attractive market. On that note, let's see what really puts American Tower ahead of SBA Communications and Crown Castle. Despite its all-American name and, in the face of Crown Castle International 's globetrotting moniker, American Tower is actually the most geographically diverse tower operator on the market. You see, the company's 28,500 actual American towers are matched by another 40,700 towers on foreign soil. American Tower owns or operates 12,000 sites in India, 8,700 in Mexico, 6,900 in Brazil, to name a few of its largest overseas markets. Fifty-nine percent of American Towers' towers are not American at all. By contrast, Crown Castle only has 1,700 towers outside the U.S. and Puerto Rico, thanks to an Australian expansion. SBA keeps 7,200 towers in markets like Canada and South America, but about 75% of its business is still conducted in the U.S. market. There's nothing wrong with focusing on North America, where another round of carrier network upgrades will start in 2015; but American Tower is chasing opportunities in growth markets that its peers simply ignore. The company covers half of the BRIC bloc, alongside rapid growth spaces like South Africa and Central America. And the company is hardly done exploring distant lands. In June, American Tower announced another acquisition in Brazil, adding the rights to BR Towers' 4,600 sites in a $980 million deal. Expect American Tower to continue growing in overseas markets. This is particularly important as wireless giants attempt to cover the next billion unconnected consumers with wireless phone and data services. They'll need tower operators to get this done, and American Tower is poised to fit the bill. That's just a quick look at some of American Tower's juiciest "buy" signals. To learn more about this company, add American Tower to your Foolish watchlist. Then dive into some free analysis from Motley Fool Supernova analyst Billy Kipersztok.